“Green Garden Park” overlooks a meadow with apple trees on its border. Surrounding our outdoor classroom are flowering bushes and rolling hills. The arbor over the gate, decorated by the children with natural materials, provides a welcoming invitation to enter the space. Inside the classroom, we have designed the activity areas in coordinating natural colors to allow for “visual flow” when viewing the whole area. 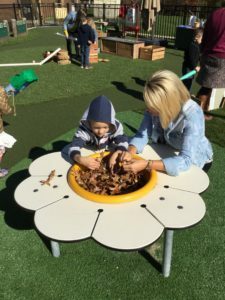 The furniture and accessories are constructed of durable wood, have natural colors, are made to withstand weather and hard use by the children, and blend well with the natural surroundings. 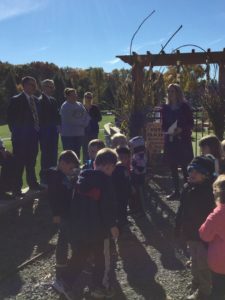 The CCLC staff members were involved in all steps of planning and designing the Outdoor Classroom. We worked with the college’s landscape architect and consulted with Nature Explore to create a space that would utilize the natural topography of the campus and meet the requirements of Nature Explore certification. Butler County Community College sits on land that formerly was a golf course, with grassy hills and tree groves throughout. The concept of the Nature Explore Outdoor Classroom perfectly complements BC3’s natural campus environment. The children helped to select the name of the Outdoor Classroom. They took several nature walks on campus to collect natural materials with which to make a wooden sign for “Green Garden Park”. Natural materials, such as acorns, grasses, bark, moss, sticks, etc. were collected by the children and families on individual nature walks and donated to this project. We added elements of “whimsy”, such as a large spinning wind wheel and a dragonfly made from ceiling fan blades, which the children painted and helped to assemble. 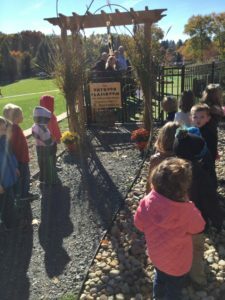 All of the plants that are planted and grown by the children are low maintenance, fast growing, and edible. 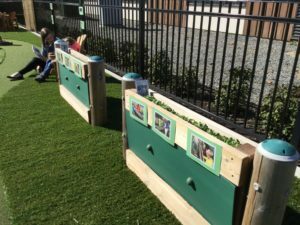 The children have planted radish and pak choy in the planters along the pathway. 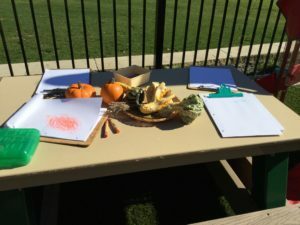 Sunflowers and pumpkins have been grown and harvested in the Garden Area. A unique feature of “Green Garden Park” is the grassy climbing hill, with an embedded slide. Next to this area is a tree, planted in memory of the Director’s mother. 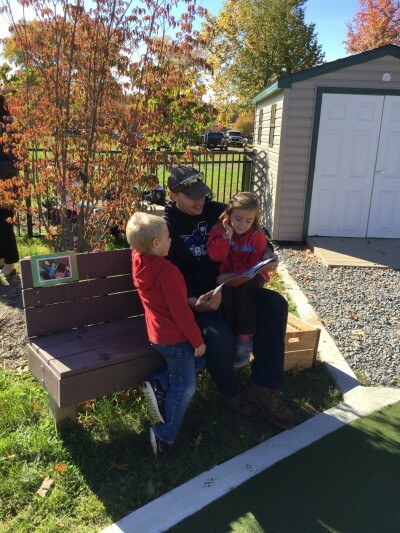 The tree provides shade, in which the children can sit on a bench and read or visit with each other. Natural materials abound in each of the activity areas in “Green Garden Park”. 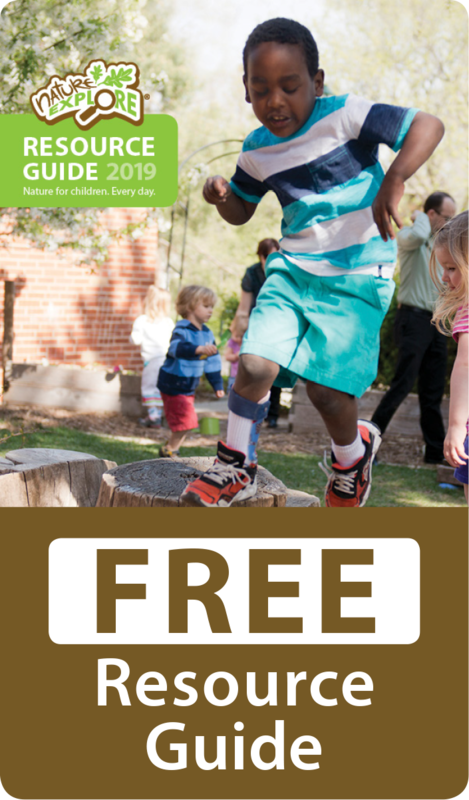 Children can sit on tree cookies, build with large wooden blocks and ramps, rake leaves, dig in the dirt/sand, observe insects, pump and pour water, construct “nature scenes” with sand, rocks, and small wooden shapes, etc. 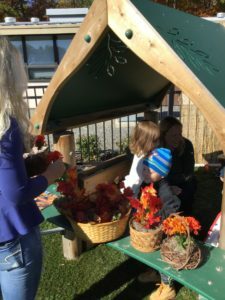 Extending the learning beyond the four walls of our indoor classroom has given the children more meaningful and varied learning opportunities. 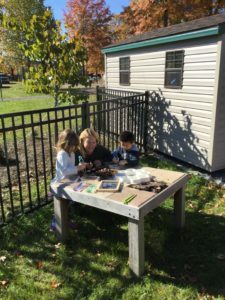 With imagination and a variety of materials, children can engage in creative learning experiences with nature, indoors and outdoors!